Delhi like any other capital city is a sprawling metropolis and is spread out over a vast distance opposed to being a city that in this modern age is growing in height. It has been aided over the years by some smart town planning to form New Delhi around the narrow weaving alleyways of Old Delhi. As a result we had a couple of days of heavy commuting to navigate around this great city. I am not here to write about what we saw and did but to let you know about what I think was an epic day of public transport travel. I think in total we must have walked about 12miles, got 8 Metro’s (15 miles total), 7 auto rickshaws (10 miles total) and 1 cycle rickshaw. I don’t think this even compares to a day sight seeing in NYC or London; the cost for all this traveling over two days? A mere 354 rupees ($8.50 / £5.30). What we had forgotten about in coming to Delhi was the fact that we were dealing with the capital city attitude so rickshaw price negotiation got a little harder as obviously the average tourist into Delhi is paying face value as its still a very cheap way to get around. But what these folks did not realize is that we were not F.O.B. we had time under our belt for negotiating good rates, determining prices that were good for you, good for me! Although one driver thought taking us to the wrong place after clear agreement of our destination at pick up, then doubling the price, once he got it right and forgetting how to speak English would make us pay up more….Wrong! But what was the most entertaining aspect of the day was the subway, as we have learnt as we have traveled that New York City is one of the toughest cities in the world, and as Frank says “if you can make it here you can make it anywhere”, he is so wise, I wonder if he had been around the world? Anyway if you can master the NYC subway system or London’s Tube system you got any other city nailed. So for us it was a nice and easy way to get round the city and we were not the newbie’s, although at first we only saw the Hindi version of the map, India Gate anyone!?! In New York if we see people struggling with directions or trains Steph and I try and help out folks out as it can be daunting, and although I now consider myself a black belt I was once a beginner going the wrong way on the 6 train. 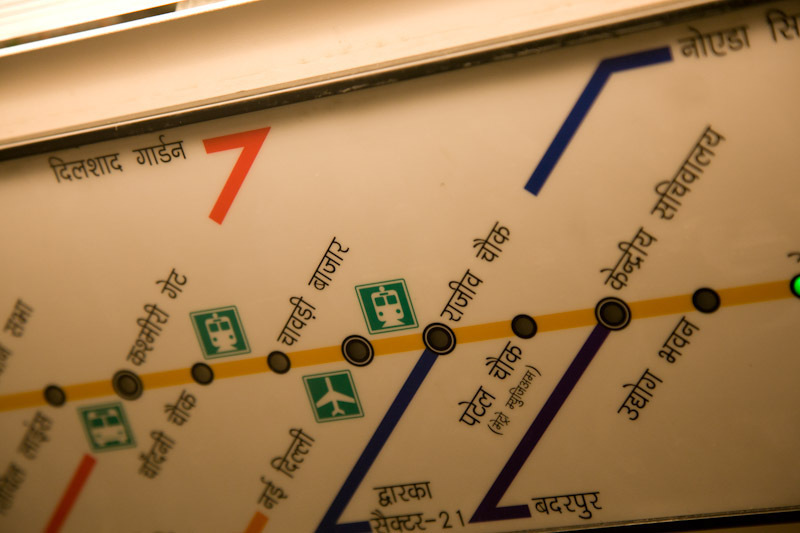 In Delhi I assume the Metro system is a fairly recent occurrence and it is not the most used form of public transport despite being the easiest (and cleanest! ), but it was funny people watching as we traveled around. There are staff to assist at every turn to help folks figure out the simple things, how to get through gates with your little token? Where to stand for the train? Little things like that, now I am not mocking Delhi as some of the things it does are smart and could help out cities such as London and NYC loads, especially with the volume of people visiting the cities, but it was nice like I said not to be the newbie’s. What was comical was that we ended up helping the locals with their troubles on the metro, once such instance Steph was helping a lady to figure out how to slot here token into the gate, which was to the amusement of all around and the embarrassment of the member of staff nearby. At the end of it all though we had checked off all the forms of transport Delhi had to offer including a private car, care of JB and that was not even our intention. But on our way back we had one last form to take, a cycle rickshaw, we had stayed away from these, as let’s just say they are not the quickest form of transport when you’re on a whistle stop tour of Delhi! But we jump in one for our last ride and had a blast, its funny how much more exposed you feel in the craziness of Indian Traffic in a non motorized vehicle! Good news we made it!